I just saw the pre-screening of this movie last night, and take it from me, this is one of the BEST Adam Sandler movies ever. It’s not his typical fare, as his character does not resemble his typical persona at all, but it is definitely shoulders above much of his work in the past. Absolutely on the level on movies such as Happy Gilmore, maybe better in its own way. Now don’t get me wrong, all of the humor is juvenile and the movie is certainly not going to win any Oscars, but expect people to be quoting it left and right, cause nearly every line is hilarious. Look out for this movie guys, cause its going to be a hit, without a doubt. Adam Sandler has hit or miss movies and this one was a big MISS for me. Just so you get a feel for the ones I liked or tolerated (Punchdrunk Love, Spanglish, The Wedding Singer, 50 First Dates, Big Daddy, Click). Ones I disliked (Billy Madison, Happy Gilmore, The Waterboy, Chuck & Larry, Little Nicky). If you’re into potty jokes and unsophisticated sexual humor, this might be your kind of movie, because there’s plenty of it. I’m surprised this is probably getting a PG-13 rating. 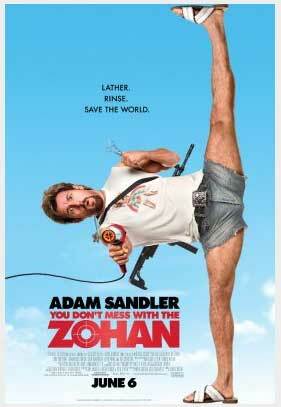 Some of the jokes in the movie worked and were genuinely funny, but for the most part, Zohan was raunchy with low-brow sexual jokes galore. If you take out the vulgar sexual jokes, you don’t have much of a movie and probably lose about 30-45 minutes of footage, which would scale this movie down to about 45 minutes and could be shown as an hour long TV special with 15 minutes of ads. I saw several people walk out during the screening of this movie and I personally felt inclined to follow their lead but only stayed in my seat in hopes that the movie would redeem itself with a better outcome. Man, what a letdown. I went with 3 other friends. 3 of us hated it and 1 of my friends just thought it was tolerable. This entry was posted on May 24, 2008 at 9:17 am and is filed under Movies with tags Movies. You can follow any responses to this entry through the RSS 2.0 feed. You can leave a response, or trackback from your own site.